Mother’s Day - Mother – Daughter Expressive Painting Class! CLASS is FULL: Friday May 10, 2019 6:30-9:00 we will paint the Sun and Moon! 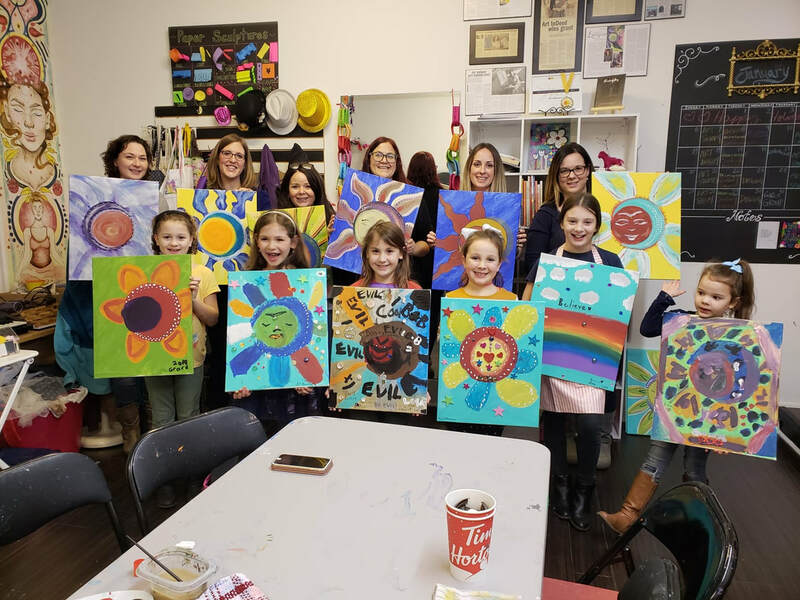 Open spots for: Saturday May 11, 2019 1:00-3:30 we will paint the Sun and Moon! Mom-daughter, auntie-niece, grandmother-daughter-granddaughter, or a special relationship with a loved one! A step by step painting and flow into your own self-expression as you are lead on a colourful, creative journey to paint the sun and moon! Enjoy a fun, relaxing and creative date where you and your partner will create a beautiful work of art starting with a HEART! We will offer a lovely glass of wine, chalk pastels, awesome music and a one of kind creative journey, lead by Danah and Chris,called: ColourPLAY! ColourPLAY is designed by Danah and is a spontaneous creative method that is for everyone! It offers laughter, joy, release, connection, curiosity, magic and beauty. Sign up for a unique and enchanting experience! At Art InDeed you can explore your creativity! Wine and Paint, you can sip and paint! Whether you are a beginner or seasoned artist the goal is to ENJOY and have fun in the creative moment! During each class you will be led by Danah in creating your own wonderful painting. A custom model painting will be set up for inspiration, but the goal is for you to put your own creative and personal touch on your piece! Danah or a staff will guide you on your creative adventure and process and be there to help you. We will provide the canvases, paints, easels, brushes, apron, WINE and a lot of enthusiasm and encouragement. Come alone for a creative escape, or bring a friend for a date night or girl’s night out?…The environment is non-judgmental, relaxed and fun. A Rhythmic and Experiential Journey in sound and art. Feel the beats that move you! You will experience Music, Sound and Art as modes of SELF-EXPRESSION. The program focuses on exposure and exploration of electronic music and arts-based activities that will allow you to express yourself creatively. Guided by professional DJ Chris Tuer and by professional Artist and Intuitive Danah - you will have an opportunity to experience and FEEL music with SUBPAC’s MK2 - an amazing new technology to feel sound. You will learn to translate music as a beautiful language of beats and harmonies and then create an expressive “Sound-Scape Painting” that you will take home. You will be amazed at what you create! Snacks and art supplies provided. Join us as we relax into Yoga flow. Enjoy a unique relaxing Yoga practice then experience intuitive art-making in connection with your Chakra System. Offered in a relaxing, self-expressive, fun and healing art studio setting (Art InDeed). Expressive painting for people interested in the fun and joy of creating in the moment! Light snacks and all art supplies provided. Bring your friends and create! At Art InDeed we offer private group sessions for you and your friends, catered to whatever type of creative class you like! We also offer private sessions with Danah centered around healing or discovering your creativity. For prices click HERE.